The Union Aerospace Corporation wants to ensure your safety. Try this U.A.C. approved Tactical Laptop Backpack. Features a main zippered compartment, 2 exterior compartments, and a ladder system for small items. Cushioned back panel and adjustable shoulder straps. The Union Aerospace Corporation wants to ensure your safety with this U.A.C. approved Tactical Laptop Backpack. Carefully designed with multiple compartments and slots, this backpack might just provide the space you need to save your life! Store your larger items in the main zippered compartment, and choose between 2 exterior compartments for more storage. For your technological needs, place your smart devices in the padded sleeve and secure them with double safety clips. Engineered for both personal and field use, the Doom U.A.C. 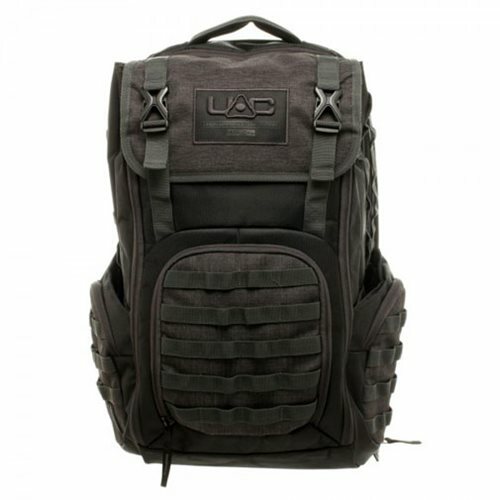 Tactical Laptop Backpack features a nylon ladder system throughout the surface to hold small items that are essential in the field or at home. Both functional and comfortable, the back panel and adjustable shoulder straps boast high-quality cushioning. U.A.C. 's development and engineering center went to great lengths to provide the best quality for its soldiers and guarantee this U.A.C. Tactical Laptop Backpack will be both essential and effective. Measures approximately 21-inches tall with a width of 14-inches. Ages 13 and up.